The craft and embroidery of given more emphasis on the target of improving the quality and network development the export market is expected to ensure continuity of batik in each area as one of the superior product areas. 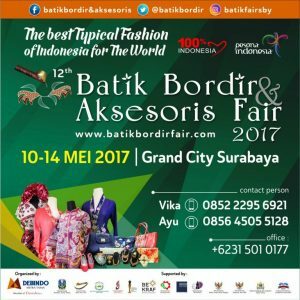 In other expected to be able to compete in the local market – regional, the batik industry also is expected to compete in the global market – around the world. One of the steps taken by the government in order to increase production and the absorption of the market is optimum for the craftsmen – the batik industry and embroidery is to build ‘image’ and appreciation as well as the promotion of the regular and continuous towards the development of the batik industry.